Although I earned my bachelor’s degree in psychology, I’m not an expert at dating or relationships. And even though I met my husband on a blind date, I’m not a match maker made in heaven. I am, however, a lover of chick flicks, romance novels, and an all-around good love story! Which is how I discovered the uncanny resemblance between marketing a dating. It makes sense when you take a step back and broadly look at each. You snag a date and have high hopes that the relationship will last longer than one dinner. You take time to get to know one another to determine if you’re a good match. Then you commit to a long-term relationship. Inbound marketing is abuzz with efforts to attract a prospect, connect with them, engage one another and then, once you know each other better, you delight in each other. Do you see the trend? Both dating and marketing follow the same pattern. If you like to read, you’re going to have an easier time finding a potential boy/girlfriend at the bookstore than at a club. So why are you at the club hunting for that special someone? Marketing calls this a negative persona: being attracted to someone who is attractive, yet they are all wrong for you. Dating that person from the club may be fun for a little while, but it will inevitable turn into more trouble than it’s worth. Stop being attracted to prospects who are cool but completely uninteresting in your business (aka negative persona). Instead, find the buyer persona who fits your wishlist. You’ll be surprised how they are more attractive than you originally anticipated! How do you attract someone? Make yourself attractive! If you want to attract that book lover, then immerse yourself in books. Hang out at bookstores and cafes where customers enjoy reading. I wouldn’t recommend reading in a club; that gives off a strange vibe. Attract that alluring someone from the next aisle in the bookstore by spending time in the bookstore. Identify your buyer personas and then determine where they spend their time. If they browse websites for book stores or book review sites, that would be an excellent place to deliver ads. If they spend most of their time on LinkedIn, be sure to have a presence there as well. You’ll quickly see familiar faces, begin to have basic “Hi! How are you?” conversations, and start to form a relationship with those around you (in the literal bookstore and in your virtual marketing realm). But there is more to a dating relationship than simply being introduced. There are only so many times you can tell that cute someone “Hi” before you actually take that friendship to the next step, such as having coffee together. Marketing works the same way! Find out what your lead is looking for. Notice if you objective align. Make a way to have a “second date” or subsequent interaction. This is where your efforts meet your contact’s needs and desires. Engaging in dating and marketing means spending time together! It’s easy to delight in someone when you enjoy them! When you have a new special someone, joy seems to radiate from within! You want to spend every moment with them, pamper them, and make each other happy. If that particular significant other is extra delightful, the relationship turns from dating to engagement to marriage. How can your marketing stay fresh so that your audience stays happy, joyful and wants to spend loads of time with your brand? That’s easy...keep your marketing cohesive and align all of your messages with your target personas. Stay true to who your company is; authenticity is attractive and doesn’t become dull. This pattern will begin a new relationship, progress to engagement, and result in a marriage/long-term commitment. Every fairy tale romance faces obstacles within their Happily Ever After. Perhaps your sweetheart is checking out a few other options while also courting you. You can’t force them to choose you; they need to walk a path toward that conclusion on their own. You can, however, put in a realistic amount of effort instead of relying on luck, fate, or cupid. Stay involved but don’t be too pushy. A phone call per week feels good, or perhaps 2-3 texts per week seems reasonable. For marketing, set up an automated drip email or retargeting campaign. If you’re valuable to them (a significant other or a potential client), they will come around again. Dating is always more complicated than anticipated. So is marketing; it’s rarely as simple as it seems! 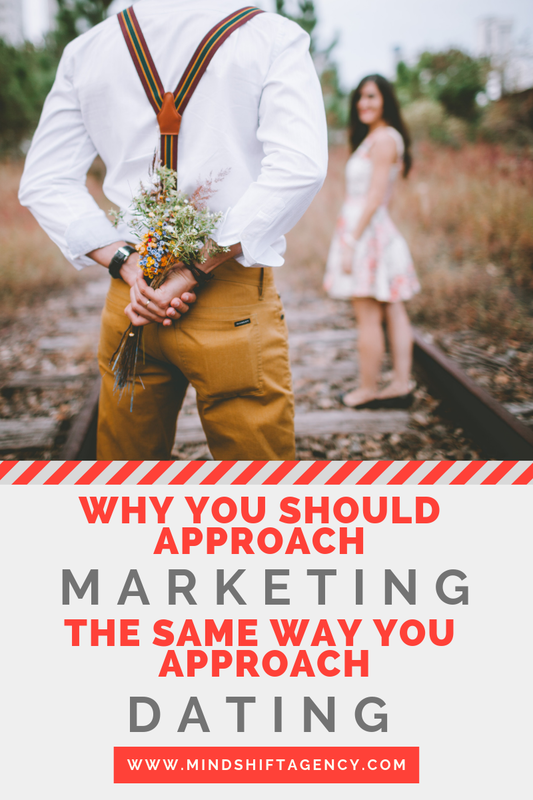 The parallels between the complicated realm of marketing and the confusing atmosphere of dating are intriguing, especially the process used to begin and commit to a long-term relationship.